A host environment provides platform-specific objects and functions additional to the language core. Web browsers give a means to control web pages. Node.JS provides server-side features, and so on. Second, it represents the “browser window” and provides methods to control it. There are more window-specific methods and properties, we’ll cover them later. The document object gives access to the page content. We can change or create anything on the page using it. W3C – the documentation is at https://www.w3.org/TR/dom. As it happens, the two groups don’t always agree, so it’s like we have two sets of standards. But they are very similar and eventually things merge. The documentation that you can find on the given resources is very similar, with about a 99% match. There are very minor differences that you probably won’t notice. Personally, I find https://dom.spec.whatwg.org more pleasant to use. In the ancient past, there was no standard at all – each browser implemented however it wanted. Different browsers had different sets, methods, and properties for the same thing, and developers had to write different code for each of them. Dark, messy times. Even now we can sometimes meet old code that uses browser-specific properties and works around incompatibilities. But, in this tutorial we’ll use modern stuff: there’s no need to learn old things until you really need to (chances are high that you won’t). Then the DOM standard appeared, in an attempt to bring everyone to an agreement. The first version was “DOM Level 1”, then it was extended by DOM Level 2, then DOM Level 3, and now it’s reached DOM Level 4. People from WhatWG group got tired of version numbers and are calling it just “DOM”, without a number. So we’ll do the same. 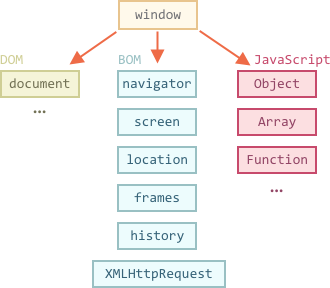 The DOM specification explains the structure of a document and provides objects to manipulate it. There are non-browser instruments that use it too. For instance, server-side tools that download HTML pages and process them use the DOM. They may support only a part of the specification though. CSS rules and stylesheets are not structured like HTML. There’s a separate specification CSSOM that explains how they are represented as objects, and how to read and write them. Browser Object Model (BOM) are additional objects provided by the browser (host environment) to work with everything except the document. The navigator object provides background information about the browser and the operating system. There are many properties, but the two most widely known are: navigator.userAgent – about the current browser, and navigator.platform – about the platform (can help to differ between Windows/Linux/Mac etc). The location object allows us to read the current URL and can redirect the browser to a new one. Functions alert/confirm/prompt are also a part of BOM: they are directly not related to the document, but represent pure browser methods of communicating with the user. BOM is the part of the general HTML specification. Yes, you heard that right. The HTML spec at https://html.spec.whatwg.org is not only about the “HTML language” (tags, attributes), but also covers a bunch of objects, methods and browser-specific DOM extensions. That’s “HTML in broad terms”. Describes the document structure, manipulations and events, see https://dom.spec.whatwg.org. Describes stylesheets and style rules, manipulations with them and their binding to documents, see https://www.w3.org/TR/cssom-1/. Describes the HTML language (e.g. tags) and also the BOM (browser object model) – various browser functions: setTimeout, alert, location and so on, see https://html.spec.whatwg.org. It takes the DOM specification and extends it with many additional properties and methods. Now we’ll get down to learning DOM, because the document plays the central role in the UI. Please note the links above, as there’s so much stuff to learn it’s impossible to cover and remember everything. When you’d like to read about a property or a method, the Mozilla manual at https://developer.mozilla.org/en-US/search is a nice resource, but reading the corresponding spec may be better: it’s more complex and longer to read, but will make your fundamental knowledge sound and complete.